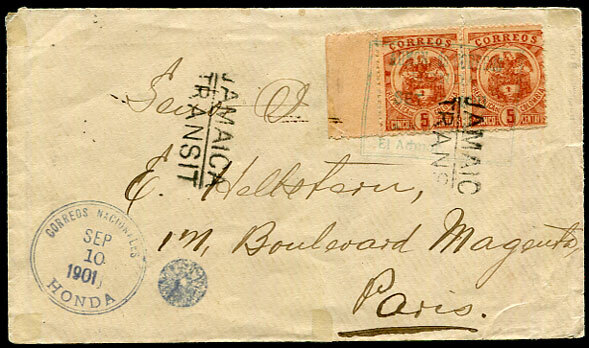 1901 cover with pair 5c pmk'd at Honda SEP 10 1901 to Paris, France with two strikes JAMAICA/TRANSIT ("A" below middle of "M"), reverse Kingston 4H/SP 25 01 transit. 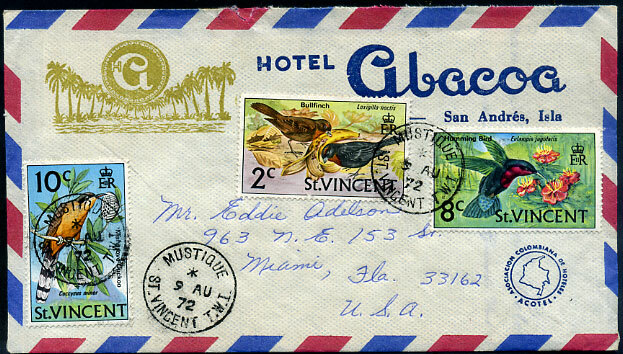 1953 (JA 19) reg. 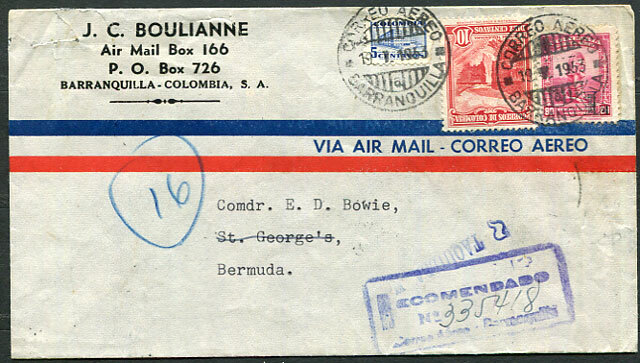 cover franking pmk'd Barranquilla to Commander Bowie, St. Georges, Bermuda backstamped New York transit. 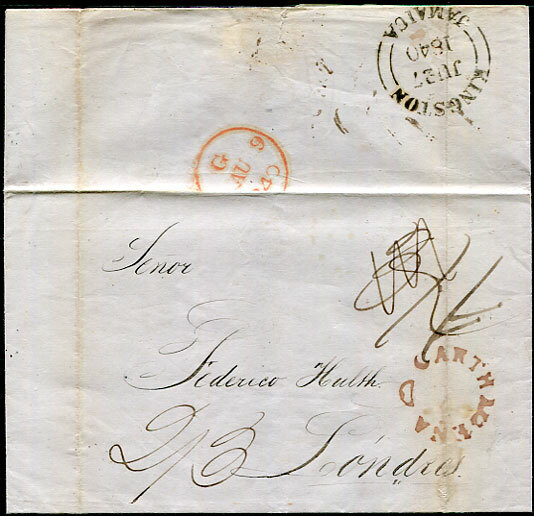 1840 entire headed and docketed Santa Marta 13 Junio 1840 to Federico Huth, London rated 3/- changed 2/3 showing strong dull purplish-red CARTHAGENA and KINGSTON JU 27 1840 transits, both crossed by same filing fold, with partial red AU 9 1840 arrival. 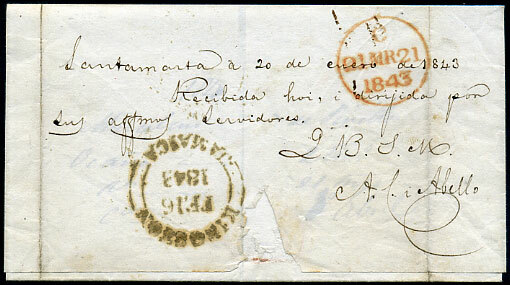 OCANA - SANTA MARTA - KINGSTON - LONDON: 1843 wrapper docketted from Marcelino de Pinillos, Ocana (Colombia) JA 2 with manuscript forwarding at coastal town Santa Marta on JA 20 with Q.B.S.M. 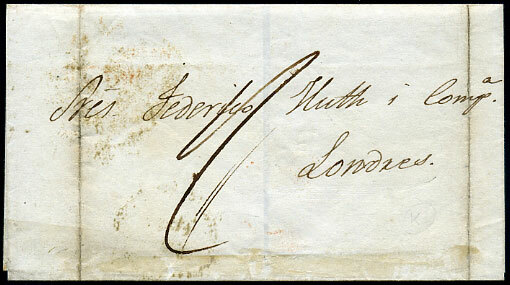 (que besa su mano - who kisses your hand) with KINGSTON FE 16 1843 dbl-arc transit addressed Federico Huth, London (MR 21) rated 1/-, address panel soiled which would display opened in inverted position.